Got to work today and realized I couldn’t do it. Total demon belly plus headache = not able to concentrate. Running a tiny fever, too. OH POOR ME. So what do I do? Come home, hook up my work laptop, hook up my home laptop, do Chemistry homework and respond to customer service questions for work. Multitask? Moi? Well I’m spent, and going to take a nap. I hope I didn’t cross my eyes or dot my tees. 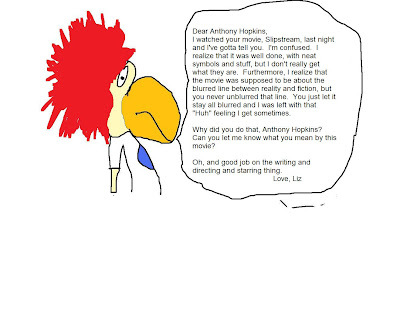 Here is a movie review in picture form, as I found the paint feature on my home laptop.